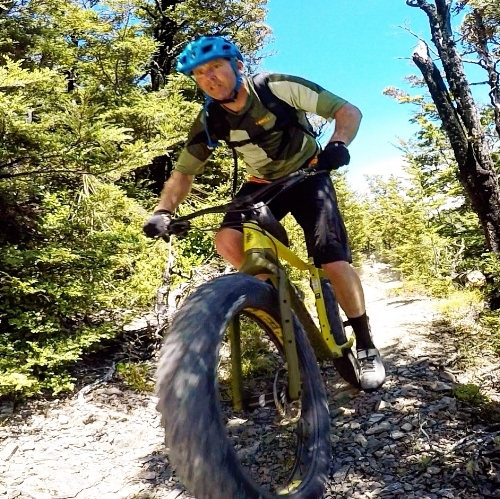 How will the fat bike designed for snow get on, in NZ dirt? I've been somewhat fascinated by fat bikes for a while and whilst waiting for the Salsa Pony Rustler to arrive I bought a fattie to get me by (check out my first impression here). It had an Alloy frame, suspension fork and heavy as wheels. I enjoyed the terrain crushing abilities of it but it was heavy and unresponsive. It got me thinking about how efficent a lightweight fat bike would be and how suitable it would be for some of my backcountry bikepacking adventures. The Mukluk on the Wharfdale track. When the opportunity arose to give the Salsa Mukluk a trial, it seemed like the ideal fat rig. It is full carbon including the fork, with the sweetest set of HED carbon wheels, decked out with the SRAM Eagle 12 speed groupset. Fat bikes were designed for snow orginally but are bridging the gap to other genres of mountain biking and even touring/bikepacking. In NZ the opportunities to ride on snow are limited to say the least, but the amount of rough untracked terrain in the backcountry in the form of riverbeds, alpine tussock and scree is astounding, especially in the South Island. I have plenty of routes on the list of 'to do' that involve this type of terrain. The Mukluk's load carrying capibility also stood out for extended adventure biking. technical terrain is a breeze on this rig. The 2018 Mukluk is most definitely from the new generation of Salsa bikes, internal cable routing is a great feature to enable clean attachments of frame bags and the like. The area available for a frame bag is enormous and easily 2 beer cans wide at the bottom bracket. The bolt on attachments are extensive, not only the mounts for the EXP Top Tube Bag as seen below, also each fork leg has a 3 bolt mount for racks such as the Anything Cage. I had only recently upgraded to 750mm wide handlebars so it was quite the experience going further to an 800mm wide handlebar, will I be able to go back to narrower bars? The spec is top notch, the 1x12 SRAM drive train is precise and crisp, the salsa bars, stem and carbon seat post well suited. By far though the stand out component is the HED Big Fat Deal wheel set, feathery light which is a major factor to this bikes BMX feel and responsiveness. Will they be durable over time? The Salsa Pony Rustler, on the left, is a medium, I am at the tall end of it's fit range (I'm just under 6'). I chose the Large Mukluk for the length of top tube and ability to stretch out on longer rides. The angles are modern trail geometry with a relaxed head tube angle (69 degrees)but still a sufficiently steep enough seat tube angle for efficient pedalling (73 degrees). The bend in the top tube makes for added standover height which is well suited for a loaded rig. For a full carbon frame it would have been nice if the drive side chainstay got a factory issue guard like the other Salsa carbon frames, nothing an old tube won't fix though. The 4.8" Maxxis tyres stick like the proverbial to a blanket and are ideal for most off road applications, however I'm thinking about trialling a 4" faster rolling tire. Ive never been a fan of SRAM brakes, the Guides RS's feel good so far and I'll continue to use them, I do have a pair of old faithful Shimano XTR trails just in case the performance fades. Before this rig the last time I had ridden a fully rigid bike was 1994 and of course back then we all hailed the introduction of suspension forks as the next best thing, now 23 years later here I am back on a rigid frame but thats where the similarities end. The massive volume tyres are all the floatation required for the roughest terrain, I'm running 6psi in the front and are down to 4-5 in the rear. This allows the rider to 'monster truck' the bike over- sand, roots, rocks mud and rivers, its impressive what you can roll over, or is it through? It is refreshing to pull up on the bars to get the front wheel over an obstacle and to not have to first pull up on the suspension, this also adds to the BMX characteristic. I've got a 5 day bikepacking trip planned for the mukluk this Summer. Its going to be a great test for the fattie due to the mixed terrain, groomed singletrack, rough as walking trail, bouldery riverbed, a hundred km of gravel road, and some tarseal to top it off. I like riding the Mukluk on trails and I can understand why some folks have gone fat for all their off road riding. The purpose for this bike in my quiver will be loaded and as far from the road end as I can get. This is a backcountry bikepacking rig.